If you aspire to make a comfortable income from your writing, you’ll find inspiration in the stories of the three people we’re featuring in today’s Certified Stories article. This group comes direct from our Certified Content Marketer page here on Copyblogger. You know what I liked best about their answers? That they were pleasantly surprised that writers can indeed make a healthy living doing what they do best. 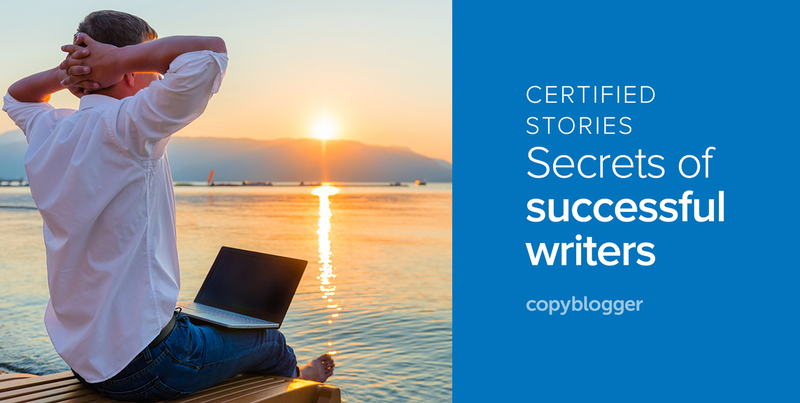 I love hearing stories like that — they make our efforts here at Copyblogger worthwhile. Read on as Aaron, Trudi, and Carin share their hard-earned wisdom. What do you wish you knew about writing when you first started out? There’s perception and then there’s reality. Sometimes we perceive our dream careers through rose-colored glasses. Once we’re in them, though, the day-to-day reality doesn’t live up to the image. But for our three writers, reality was better than perception. What’s the one thing you did in the past year that helped build your business? Our three writers answered this question differently — but their answers share a common theme. Over the past year, each of them made a serious commitment to their businesses. Is there a writing tip you’d like to share with Copyblogger readers? There’s nothing like the voice of experience, is there? Our three writers have picked up mindsets and habits that have helped them in their careers. We asked them to share what they’ve learned along the way. And Carin repeats the advice we’ve shared here many times: write — even when you don’t feel like it. What was your favorite aspect of the Certification program? Finally, we thought you might enjoy hearing about our Certified Content Marketer training program direct from three writers who have taken the course and gone on to be certified. Trudi appreciated one particular piece of course content — and saw one sign that this course was the right one for her. Writers: Are you looking for proven ways to position yourself for greater success? You know, i’ve been wading through uncertainty for a little while now: how do I market myself, how do I pitch to clients, what if i’m not good enough. So it’s definitely good to hear from certified writers, and comments like Carin’s about the ugly first draft are a good reminder to keep at it. I joined Authority not too long ago, which was pretty scary because of the investment. Education isn’t one-size-fits-all, but i’m finding Copyblogger to be a pretty snug fit at the moment. It’s helped me find the structure I needed to approach freelancing, content strategy and copywriting more confidently. I just wanted to express my gratitude. Thanks for your comment, Melissa! I’ve done the “book as business card” bit, and certainly it can work if the book’s on the right topic. But my shortest book, perhaps more properly called a booklet, took me two days to write and is outselling my other sixteen combined. Some topics are more popular than others. So can a writer earn an income writing? Of course. Can the writer earn that income without doing some sort of research into the business aspects of it? Not likely. I have made it one of my goals to join Authority. In time. In time. . ..
I’ve been reading so much lately about the Certified Content Marketer training program, and I’m chomping at the bit! Can someone please email and let me know when I can sign up? I’m ready! The program will open very soon. It’s eight modules total, and they were created by none other than Brian Clark and Sonia Simone. The modules are delivered over four weeks. At the end of the four weeks, you have the opportunity to apply to have your content reviewed by the Copyblogger editorial team. We are going to “fast track” the first applications that come in, so the sooner you sign up, the sooner you can get through the material and send in your application. People on the official Certification interest list will find out when the program opens a couple of days before everyone else. If you’re not already on the list, add your name at the top of this page, and watch your inbox! Thanks, Pamela! I am on the list. I’m an Authority member, and I’ve been following Brian and Sonia for some time. That’s why I’m so excited. I’ll keep checking my email. Thanks again. I can certainly relate to Carin’s “write everyday” even when you don’t feel like it. I’ve also found that discipline is the key to success. I’d like to know more about CopyBlogger’s Certified Content Marketer training program, is it only written for hired writers? I’m an independent blogger, would it still be a beneficial course to me? The course is for people who are writing professionally — either as freelancers or within an organization. It includes writing advice and career/business building guidance that’s tailored toward people who are making a living with their writing. I definitely picked up a bunch of great writing tips from this. Thank you so much for sharing. I’ll have to look into the Certified Content Marketer training program. Thank you. This is a great article and read, thanks so much for sharing some quality. That’s one thing at first I struggles with on my blog, not really knowing how to write properly or for the audience.